2) “So, if I hate to read books, why would I buy yours?” I’m not going to say that The Thief’s Mentality is entertaining, I’ll leave that up to the reader, but I’ve written over 500 articles. Most of the articles are unique and they stand on their own. As such, I’ve tried with as much objectivity as possible to collect (for lack of a better term) a “greatest hits” package for the reader. When a writer is on point, they tend to belabor. We all do it. With extensive editing, I think I’ve kept this to a minimum. I’ve tried to write a book that is as stimulating, engaging, and entertaining to you, the reader, as I possibly could. Entertaining you is one of the hardest things to do, of course, as we’ve all jumped through the hoops, performed on the pommel horse, and removed some of our clothing to entertain you. For various reasons, we’ve come up short, and we’ve decided the only best we can do is entertain ourselves and hope that you consider it just as entertaining. 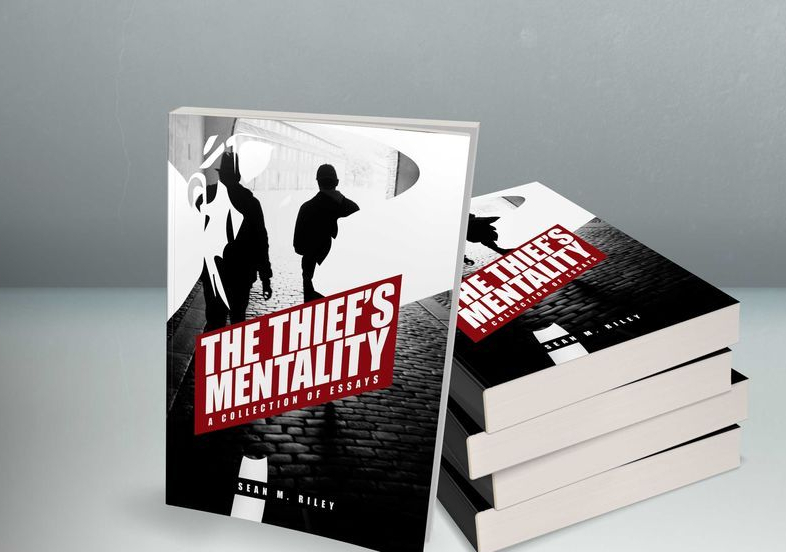 We directed The Thief’s Mentality to those who say they don’t have time to read. We directed it at those moments in life when we have time to kill. Some theorize that the average person spends one and a half years of their life waiting in line. Whether we’re waiting to buy tickets to a movie, waiting in line at the local supermarket, or waiting for our latest inoculation at the doctor’s office, we would love to have something to do while we’re waiting. Some small time operations place mirrors around elevators, larger operations place digital ads around the areas reserved for the line, but what better way to lessen the pain of waiting is there than an entertaining and informative book? Something that feels substantial. This book will not fill that year and a half, depending on how slow you read, because it is a relatively thin book, but it may relieve a couple of hours of pain. We all play around on our phones, and most of us read internet articles, but how many can we read about the Kardashians before irreparable brain damage sets in? Human beings need constant stimuli to keep the synapses firing. We need substantive information and entertainment and when writers spend twenty pages writing about a Wisteria tree by a lake, we experience burn out. We want to read an author who knows how to get to the point, and at this point in our lives, we want something entertaining, informative, and different. 3) The Speed Reader. “I can read any book you’ve read, in about an hour and a half, and tell you everything about it. I might even be able to tell you things you missed,” a friend told me after completing a class on speed-reading. “There’s just so much fluff in every book a person reads.” Her arrogance annoyed me, but I thought she had a point. I also considered the idea that the only reason she took a speedreading class in the first place was that she didn’t enjoy reading as much as I did, and she wanted to find an end run around the traditional and methodical ways of educating herself. I never took her up on the challenge she posed, because I didn’t want to know if she could match my weeks of reading in a little over an hour. This led to another thought that chased me into adulthood, if her abilities to speedread were as accomplished as she suggested, and she could teach me things about books I carefully read, how much of my life did I waste reading that I could’ve spent being more active? I love to read now that I can choose the books I read, and some of them are the books my English teacher forced me to read, but even the most avid book reader will acknowledge that they spend a lot of time reading them, time that we could spend being more active. Even the most readers will cede the point that most books contain a lot of fluff, but we would argue that in the course of careful reading, a reader learns how to use finer points to support their logic and conclusions. In doing so, I would think, the reader learns not only how to form an opinion, but how to map it back to the central point by tracing the manner in which an author uses various rhetorical devices to achieve a conclusion with supporting evidence. The fluff, as my speedreading friend called it, lies in the supporting evidence. The author’s job, as I see it, is to either delete as many extraneous (and in my opinion far too numerous) finer points or make them so entertaining that no reader will consider them fluff. One of my many goals was to find that author who accomplished this feat so well that speed-readers wouldn’t want to skim in fear of missing a word. I found some, of course, and I loved their work so much that I tried to write like them. 4) Descriptions. One of the finer points, this book lover detests are the unnecessarily lengthy descriptions of scenery some fictional authors indulge in. Some of our greatest authors spent so much time describing scenery that even the most ardent book lover might speedread to the point. In some cases, these authors don’t even deliver a payoff for these lengthy descriptions. The purpose of their lengthy descriptions, in some cases, was the unnecessarily lengthy description. The Thief’s Mentality did what this book lover wanted other authors to do, cut the crap and get to the point. The Thief’s Mentality doesn’t inform the reader about the shapes of the clouds in the sky the character walked under, and there are no tumbleweeds rolling across the prairie, because the settings do not involve prairies. We tried to avoid exclusivity, but the settings of all of these stories occurred on the planet Earth. As such, the reader can feel free to assume that the natural settings surrounding the characters in these stories are those familiar to Earth bound creatures. We felt no need to remind the reader that the situations involved in the stories occurred on Earth. 5) Writing to Writers. Some books are letters to their peers, critics, and other writers. The exhaustive descriptions of scenery, for example, are their single leg swings and scissor kick on a pommel horse appeal to the scoring system of their judges. I understand writing “Jack and Jill went up a hill to fetch a pail of water. Jack fell down and broke his crown, and Jill came tumbling after” is too simple and uninteresting for most writers. Writers want to dig into the characters of their stories to let the readers know who Jacks and Jill are, and they delve into descriptions of setting to place the reader at the scene, but those who hate to read consider so much of that nothing more than fluff. One writer I enjoyed reading spent so many pages describing a monster in his novel that I put my reading out of its misery, and I never read the author again. That author is a painter, so his ability to paint intricate detail with words was admirable and exhausting at the same time. I admired the author’s style and his ability to bring this monster to life, but I considered it a chunk of exposition only a writer could love. To paraphrase the late Christopher Hitchens, such passages are private letters, written to appeal to other writers, appearing in public space. 6) Strange Strategy. Most readers who hate to read enjoy it when an author includes some swearing, slang and colloquialisms. They can relate to a character that swears in the manner they do, and they may consider it a strange strategy to delete such words from a collection of essays about real people. The dilemma the author faced was largely self-imposed for while he recognized that using swear words and slang can customize a character to familiarity, abundant usage of such norms can be distracting. Using them is also a very “writerly” thing to do, and it shows how hard the author is working to be “cool” to the reader. The author opted to forgo all such efforts under the guise of consistency. Another note to add on this subject is that most of us remember an era when network censors were more stringent, and those network censors defined an era. Back then, their edicts seemed so silly. We often said things such as, “Rambo can mow down an entire militia poised against him, but SNL has to fire a guy who accidentally drops an ‘F’ bomb on air? We need to loosen the restrictions on these artists. We need to follow the European model. People cuss on TV in those countries, and no one is harmed by it.” Now that these restrictions are essentially gone and actors can pretty much say whatever they want, some of us miss them. Morality plays an undeniable role, as we cringe when we hear ‘F’ bombs and ‘S’ words on non-subscriber cable stations, but it’s more than that for some of us. Some of us enjoyed the wink and nod creative ways in which scriptwriters dodged network censors, because we said, “They have to do it that way.” We didn’t know it at the time, of course, but looking back, we now recognize how creative those writers had to be to comply with the Broadcast Standards and Practices. What was also not so obvious at the time was how much material we all had regarding those silly standards and practices. When the higher ups considered something naughty, their edicts made the jokes and innuendos naughtier, more humorous, risqué, and more entertaining. As a product of that era, I found some of the efforts to “get away” with various dodges hilarious, and I employed some of them in The Thief’s Mentality.